Legends: The Enchanted is a comic made by Nick Percival. Some of the most known fairy tale heroes and villains are a part of this story set in a steam/cyberpunk-ish universe. One of the main characters is Red. 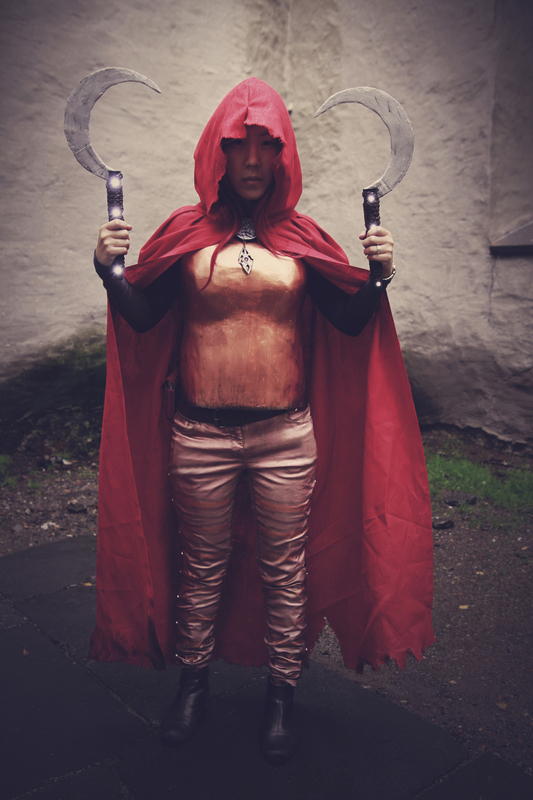 Cape is made from red linnen, the pants are bought and modified with led lights and sprayed with copper paint. The sickles are made from craftfoam and the handles are led lights in a tube. Armor is papermaché over craftfoam and spackle (fillings), painted in copper. The brooche and pendant are made from fimo clay and with a small gemstone embedded.